They also have the announcements at South Station and Back Bay.
. . . ummm not really. With a conductor and a crewmember at the 1st and 5th doubles of a 6 car set, if you were waiting at the 3rd double where the missing crewmember would have been at most you would walk 2 car lengths (past the the 4th and 5th cars to the rear or past the 3rd and 2nd cars to the front) to reach an attended door. If you were standing anywhere else, your walk would be shorter, unless you walked away from the nearest set of attended doors to reach the opposite end of the train. Although the new procedures may seem inconvenient on the south side where passengers were used to boarding and exiting any old place they felt like doing so, bear in mind that these are Federally required procedures. The fastest way for trains to complete their trip is for passengers to board or exit only at doors where a crewmember is present. Opening a door and trap yourself may get you on or off the train sooner, but the train (and everyone else left on board) will be delayed because a crewmember must now walk through the body of an often crowded train to close the door and trap that was opened, and then walk back through the same crowded body of the train to return to his/her assigned position in order for the train to move. Closing or opening of doors and traps from the ground is a rule violation for the crewmember that performs it (except in case of emergency). The train you speak of didn't encounter any delay from the schedule until someone on Framingham took it upon themselves to open a door and trap from the ground. 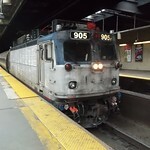 In spite of only having 2 crewmembers this morning, the train was still able to get to South Station ahead of schedule. If there is a fully loaded 6 car train, then the point is moot. These rules do not apply to rush hour trains which is the only time all cars are used. Edit: I've been brought up to speed, somehow I missed that this was now applied to all trains. My mistake. With a conductor and a crewmember at the 1st and 5th doubles of a 6 car set, if you were waiting at the 3rd double where the missing crewmember would have been at most you would walk 2 car lengths (past the the 4th and 5th cars to the rear or past the 3rd and 2nd cars to the front) to reach an attended door. This is great for the person standing outside who can quickly look to see where the nearest crew member is, but If your standing at such a door from the inside, you now have to come to the realization that no conductor is coming, take a 50/50 shot as to which direction the nearest conductor is, and scurry through such cars (often crowded as you mention; and for the south side, often running up and down stairs) in the hopes that you'll get to the correct vestibule before it's closed. The fastest way for trains to complete their trip is for passengers to board or exit only at doors where a crewmember is present. This is not true. Especially in a short staffing situation, If one conductor can work multiple doubles, this greatly decreases dwelling time. ...a crewmember must now walk through the body of an often crowded train to close the door and trap that was opened, and then walk back through the same crowded body of the train to return to his/her assigned position in order for the train to move. Someone who does that is not very good at their job. Close the doors you're at, then walk through the car once and close the other door(s). I should add that I'm not condoning people opening their own doors, just pointing out that the delay is less severe than stated. I feel it is most efficient if all doors on rush hour trains should be opened (by the crew). If there must be a crew at each door being used, then we need a lot more conductors! It is the policy that I'm against, not the crew. This was in reference to an inbound rush hour train, not a generic train, there are few if any interzone passengers on this particular trip (p502). Can't be in two places at once, so can't really work multiple doubles. Not allowed to operate (move the train) with open doors and traps any more due to new procedure. It's best to be at your assigned position prior to starting a move, trust me you don't want to confuse passengers any more than they already are. Besides, you may not make it back to your assigned position in time for the next stop. Not saying it's perfect as far as dwell time, but in overall implementation of the new procedure, the quicker the south side passengers learn to accept the feds decision, the easier this is going to be. Oddly never ran into such chaos on the north side, even prior to the new procedure. My opinion, the MBTA should consider long-doors for future CR car purchases. They can even get a test train for long-door equipped cars from New Jersey. I was thinking the same thing the other day while looking at photos of those MLs that New Jersey and Montreal bought. I like the door setup. Both versions have a long door at each end (looks like NJT's have a trap while AMT's do not) AND a pair of high level only doors. All I know is that the new boarding procedures have added at least 5 to 10 minutes travel time to the trains that I have taken over the past couple of weeks on the Providence line. It's a particular nuisance on the outbound trip when you never know which doors will be opened. I have started just riding in the first two coaches only because I know the high level doors will always be opened. I understand that it's a Federal requirement, but maybe the conductors could announce which doors will be opened on the outbound runs. Also, in order to speed up boarding, maybe the MBCR could get a waiver to have the conductors start to open the doors as the train is pulling into the station, instead of waiting for the train to come to a full stop. I remember reading something earlier in this thread that another system got such a waiver. Also, all of the conductors on the train should open their doors. I rode an outbound rush hour train the other day which only had two pairs of doors opened when we pulled into Mansfield (the busiest stop on the system). As you can imagine, it took a long time for everyone to get off of the train. How did I know there were three conductors on the train? All three were watching out an open door when the train pulled out of the station--including the one who apparently opened the door for the view, but not for the passengers! Somehow this got deleted, but I asked why they couldn't board in the last few cars at the terminal, someone responded back because of the mini highs, then I asked couldn't they just pull the train forward, I rode a train of the Fairmount train today and that's exactly what they did. Also, I rode a train back to Boston that had originated in Franklin. 2 cars were used, yet the conductor only opened one set of doors at one end of one car, instead of the doors where the cars are closest together. I sort of wonder if these things are signs of another silent strike. The set of rules are two use the 2 the cars adjacent to the locomotive at all times. Using cars on the train elsewhere and spotting those cars at the mini-high levels is against the rules. But sometimes for different reasons, the cars adjacent to the locomotives maybe defective(dirty, broken doors, hot, etc.) and this will be done. This is done for passenger safety and comfort. One of the biggest complaints I get from passengers all the time is, why do I have to walk so far at all of the stations. Unfortunately the mini-high levels were set up on the outbound ends long before anyone thought they would be used for all trains. I ask(as in the post above), when discussing trains you ride that you do not use specific trains(and times), as this is a discussion and not a hot line to report violators of rules to the MBTA. 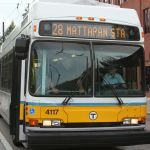 If you feel the need to complain, that you take that up directly with the MBTA or MBCR. Personally I don't see what all the fuss is about regarding walking inside the train to find the open doors. I've ridden almost all of the peak outbound Worcester line trains this summer, and unless you get up from your seat AS THE TRAIN IS STOPPED AT THE STATION, there's plenty of time to find the right door. Just look for the one with all the passengers standing by it. Sure, you have to wait in line, but it's not like you'll miss your stop by having the train leave with you still on board. jscola30 wrote: Somehow this got deleted, but I asked why they couldn't board in the last few cars at the terminal, someone responded back because of the mini highs, then I asked couldn't they just pull the train forward, I rode a train of the Fairmount train today and that's exactly what they did. Also, I rode a train back to Boston that had originated in Franklin. 2 cars were used, yet the conductor only opened one set of doors at one end of one car, instead of the doors where the cars are closest together. I sort of wonder if these things are signs of another silent strike. Regarding the train being pulled forward on the fairmount line it has to be done at readville sta in order to clear the home signal, I believe fairmount may also have spots for the engineer to pull down. Its not easy just to pull the train down in all cases, especially where you are looking right at a signal when you make your station stop. If you pull past the signal and stop that causes a Delay in block situation which either is going to require the train running at restricted speed for a bit or even calling the dispatcher for permission to move again which only causes delays. Finally the system wasn't made for the rear double to be spotted on the high level for the most part if things were changed around then that would require the conductor giving the engineer a spot at most stops which causes even more work that is not necessary. Maybe a new system will come out of this.....If they put visual screens in each end of the car likethe Amfleets, tehy could not only display station stops, service announcements, ETC....but also which way and how far to a open door. All it would take is a small sensor on the door and the wall of the car to make such a system work. Is it normal for trains to operate out of just one car at night? The 9:35 to Reading was only using one car. I thought the standard minimum was to use two? Also, it was the second car they were using, despite the first one being a bi-level with much more room. Yes it is normal to see one car open on quiet trains. It is also possible that there was something wrong with the double decker(PA not working, bathroom odor issue for example) as well. The rule is to use the door between the head two cars at all stops.